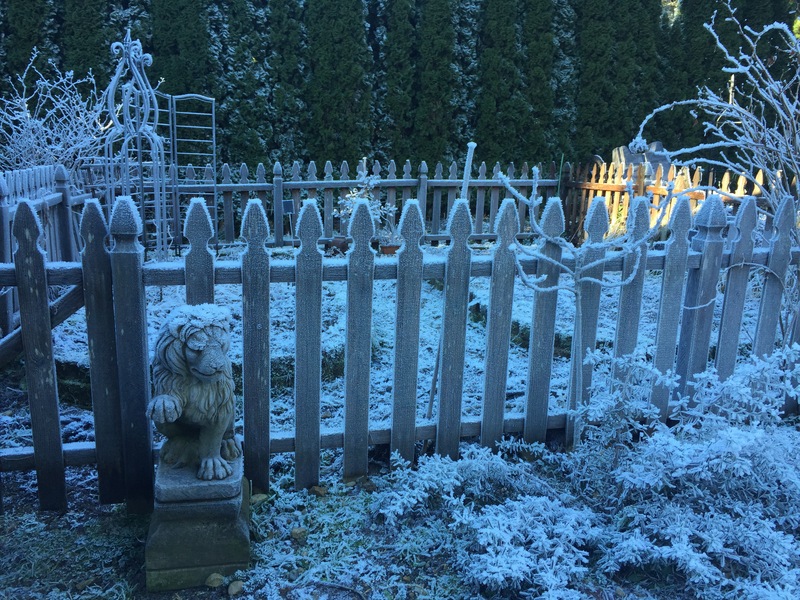 We recently had our first freeze (and a little snow). This turns the Dahlias brown and mushy and is my indicator that it’s time to get them ready for winter. I start by cutting the stems back about 2″ from the ground. Then cover with a heap of magnolia leaves (any leaves will work). And follow with a folded up burlap sack to add insulation and keep the tubers from rotting. 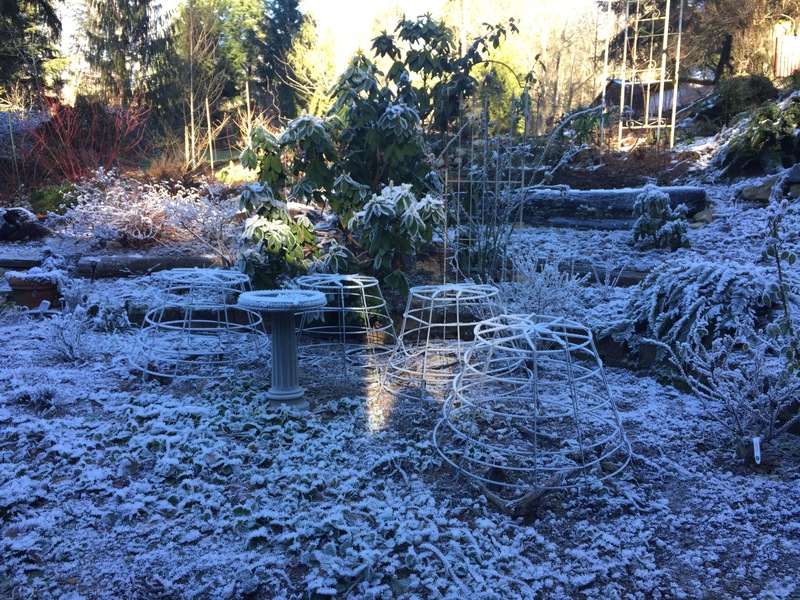 This system works for me because we have moderate winters in Seattle and the burlap adds just enough insulation to keep the frost away (I’ve never been successful digging them up). This is an improvement from last year when I didn’t have the cages — when my chickens kicked around the burlap and leaves and left the dahlias exposed to the elements. I’m really fond of the cages I put together using heavy duty fencing and 4′ t-bar stakes. They worked pretty well keeping the dahlias contained this summer AND they’ll help keep the dahlias covered all winter. I also throw all the stems and leaves in the garden bed until spring – more food for the worms. We just cut this magnificent tree down and, worst yet, while she was blooming. It still makes me sad to look at the gaping hole that’s left behind. If you knew this tree, you’d understand why we did it. She’s been slowly dying over the last few years. It all started when one of her three large trunks snapped and fell onto one of the others. We promptly cut that trunk down but knew it was the beginning of the end. This year her buds (1/4 as many as normal) were turning brown as they were opening. She was covered in bugs and getting eaten alive by woodpeckers. It was time. As a word of caution….when she was originally planted they thought she was going to be a shrub. 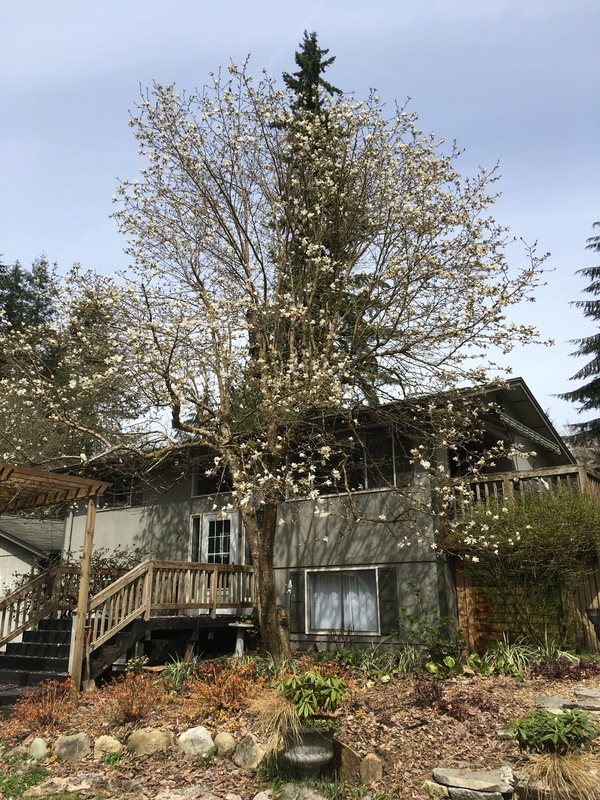 The plant tag stated she’d only get 10-15.’ She was planted in a prominent spot in front of the house where she grew and grew and grew. She grew into a stunning tree. She just got a little too big, had a few too many trunks, and was a little too close to the house. We will find another ‘Merrill’ to plant a little further away from the house. She will also grow to be magnificent (over 20 years). And our neighbors will finally forgive us (they’re not really mad, just a little confused). The lesson here? Plant tags often share the size a tree or shrub will get over 10 years — but in most cases the plant will continue to grow. We have unlimited resources at our fingertips that weren’t available 10-20 years ago. I double check almost every time now. 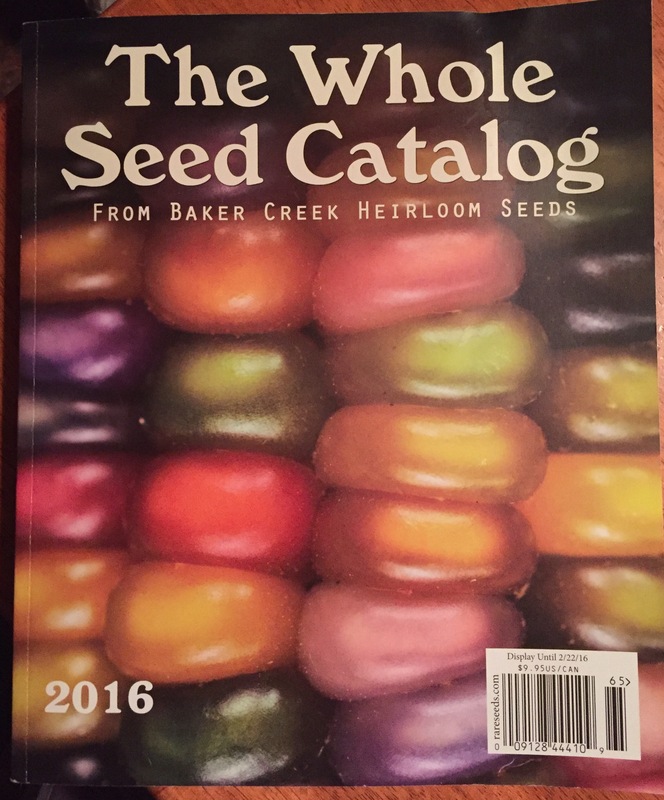 This year I decided to go with Baker Creek to order my seeds. Not for any specific reason except I did buy their catalog (on a whim) and thought I should put it to good use. It’s a beautiful catalog – not sure about the almost $10 price tag. Some of the more interesting things I’m going to attempt to grow in my zone 7a/b garden are melons. I ordered Minnesota Midget (70 days) and Katanya Watermelon (60-70 days). I also ordered some dahlia seeds. Anyone every plant dahlia seeds? I thought it was worth a try since I do love dahlias. I’m guessing they’ll take a couple years to bloom? I look forward to finding out. I even ordered a new grow light for the garage — so I can have two tiers of starts. 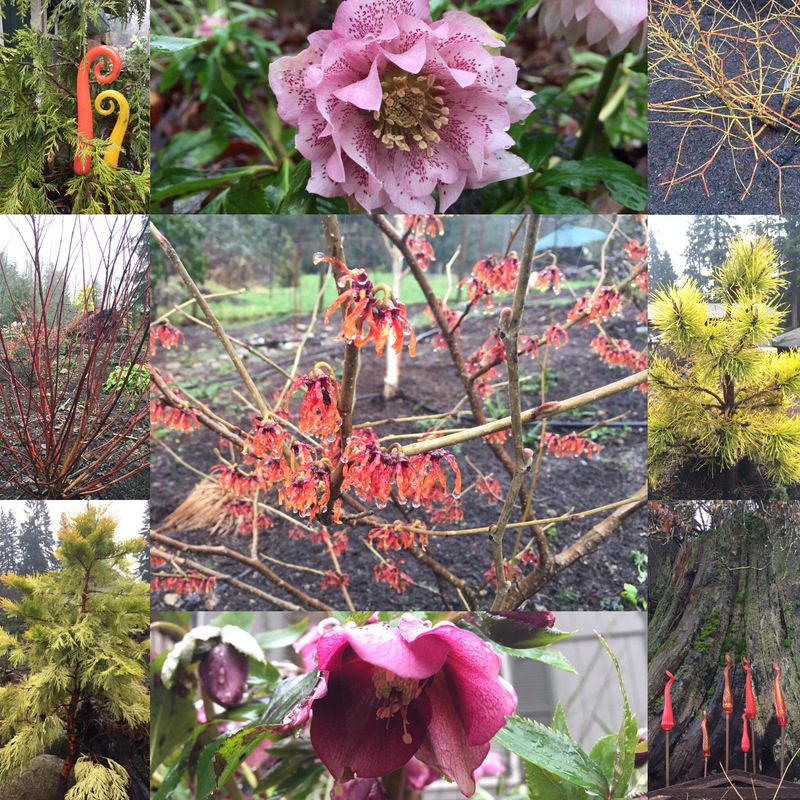 Anyway, now is a good time to start planning your 2016 garden. Do a little seed inventory and get your seeds ordered. Other seed suppliers I enjoy include Territorial and Renee’s Garden.